Australia's carbon dioxide emissions have grown faster than any other major industrialised country since 1990. It's also at the forefront of efforts to replace the Kyoto Protocol with a political deal that would absolve rich countries of any responsibility for past emissions. Coincidence? Equitywatch doesn't think so. As Barcelona Climate talks crawl to an end, expectations of an ambitious outcome from Copenhagen further diminished. In the plenary of the AWG-KP, developing countries and their blocks, one after another, expressed their disappointment and anger over no progress being made in Barcelona. They pointed out the increased efforts of a developed countries to get rid of the Kyoto Protocol. Sudan speaking on behalf of G77 and China expressed serious concern about little progress on the key issue of second phase reduction commitments of the Annex I parties under the Kyoto Protocol. They protested against attempts to “kill” the Kyoto Protocol and asked the Annex I parties to “faithfully” engage in fulfilling the mandate of AWG-KP and the Bali Action Plan. China said that Kyoto Protocol is not a fiction, it is not a guidance, it is not a declaration. It is a legally-binding treaty signed by nations. China regretted that now developing countries are being asked to change the legal treaty into domestic commitments. China feared that “great escape of developed countries from Kyoto is going to happen in Copenhagen”. They said that AWG-KP has a very bad habit of reporting progress of no progress. John Ashe, Chair of the AWG-KP in his closing address said that progress in Barcelona was less than desirable. This was followed by the plenary of AWG-LCA and the same sentiments were expressed by the developing countries. India said that though it was disappointed by the progress made in Barcelona they categorically reject attempts to declare Barcelona a failure. India said that it is not prepared to give up at this stage and that it will certainly retain the audacity of hope. They said that those who promised to take the lead wish to fall behind but India will go ahead. India stressed that developed countries which are not a party to the Kyoto Protocol (the United states) must come up with commitments comparable to the Annex I parties under the protocol. Outside in the corridors there was a general sense of failure at the Barcelona talks. Few delegates from African nations were heard discussing whether there is a point in taking large delegations to Copenhagen as no legal outcome is expected. There was a simmering anger in almost all developing country delegates about the new spin being given to an outcome coming from Copenhagen as a “political declaration”. It now seems impossible that Copenhagen will deliver a second phase commitment period for Annex I countries. Hiding behind everything, and everyone—in plain view. The US holds a press conference in Barcelona, Friday. Jonathan Pershing, the deputy US climate negotiator, addressed journalists at a press conference on Friday, Barcelona’s closing day. Halfway around the world, Equitywatch is having a hard time with US officials standing in plain view and hiding their inaction behind anything they can. Mr Pershing was asked whether the targets being considered in US climate legislation are comparable with what’s being promised by other industrialised nations. He replied by arguing that, relative to 2005 emissions, EU and US targets are roughly comparable, 12% and 20% respectively. But since 1990, US greenhouse gas emissions have grown by 16% while EU emissions have declined by 8%. Thus, relative to 1990, there is no comparison—the US is aiming to cut by 7%, whereas the EU is aiming for 20%. Equitywatch thinks it should be a fairly simple matter for countries like the US, Canada, Australia and Japan to take responsibility for the emissions growth they’ve allowed since 1990 (not to mention historical emissions). We’re having a hard time with these incessant, obfuscating efforts to get a free pass. There’s also the question of what the US’s target of 7% emissions cuts by 2020 means in terms of real emissions cuts within its borders. The last time Equitywatch checked, US climate legislation before the Senate doesn’t actually require US industry to reduce its emissions before well into the 2030s. This is because offset rules would allow most of the cuts to happen overseas; or, through changes in US agriculture and land use. Either way, US industry is allowed to continue increasing emissions. Thus, when Pershing said that the US’s climate legislation, “would be amongst the most far reaching in the world,” Equitywatch was momentarily confused. But then we realised he must be referring to the fact that most of the US’s emissions cuts could take place outside its borders. US officials have often alleged that developing countries, such as India, hide behind their poor to deflect criticism about emissions from a growing middle and upper class. The implication is that per capita emission figures are low only because of a large number of poor people whose emissions are next to nil. Equitywatch figured it was a claim worth testing. Our analysis found that the richest 10 per cent of Indians emit no more per person than the poorest 10 per cent of Americans. Equitywatch wonders where he got the idea to say something so blatantly dismissive of the historical responsibility of industrialised countries in causing climate change. But it didn’t end there. Reinfeldt also pointed to India’s “major potential when it comes to increasing energy efficiency”. Equitywatch would like to point out that in the US, energy economically viable energy efficiency opportunities have been estimated at over 800 billion kWh, while India’s total electricity consumption is 500 billion kWh. Our straightforward request: perhaps Mr. Reinfeldt could return to Washington and make his energy efficiency proposal there? Yvo de Boer said Thursday he doesn't think a comprehensive deal can be reached in Copenhagen. So then what? Equity watch is on the case. There are strong rumours that Denmark, the president of CoP 15 has prepared a 8-10 page alternative climate deal. It is increasingly evident that a multilateral legally binding treaty may not be signed in Copenhagen. Therefore to reach at least some deal at Copenhagen the Danish government has apparently prepared a treaty which is based on schedule approach and therefore demands actions and emission reduction from all the countries in the world. The document is said to contain first pages of text which could be termed as the decision of the CoP. After that there is schedule which contains the obligations of all the countries. This approach, if taken, would do away with the differentiation between developed and developing countries and the principle of “common but differentiated responsibility”. Also it completely ignores the principle of equity. Apparently Denmark is sharing this with a closed group of countries called as friends of CoP president and includes Australia. Today morning, the Chair of the Ado-hoc working group on long-term shared vision. put forward a highly controversial non-paper on long-term shared vision. Non-paper number 37 was titled “Revision of paragraphs 15 and 16 of non-paper no. 33”. Developing countries strongly registered their protests with the non-paper and were successful in stopping it from going forward. The main problem was that the paper was diluting the text on shared vision. Paragraph 15.1 starts as “The shared vision is a comprehensive global approach to enhance the full…”. Negotiators said that “comprehensive global approach” is a new term that has been introduced and could mean including markets etc. In the entire paper there are several terms that dilute the actions on shared vision. The paper also talks about action to “address climate change”. Negotiators said that this was incomplete and should actually be “address climate change and its adverse effects”. There is mention of developed countries providing the developing countries additional financial resources but it fails to mention anything on transfer of technology. Sudan on behalf of G77 and China objected to all the anomalies during the contact group meeting today morning. Today most of the negotiations took place in closed informal groups. Negotiators confirmed that even after yesterday’s promises that there would be focussed discussions on the issue of reduction numbers of Annex I countries, no progress has taken place on that aspect. The day saw hectic activity with most of the contact groups on both the working groups resuming work. But most meetings were closed for everyone except Parties. “We have not made any real progress this morning,” said Ambassador Lumumba of Sudan. He said that G77 and China and all other developing country blocks like the African Group, SIDS and AOSIS will not settle for anything less than 40 per cent reduction from Annex I countries. We seem to be running into a deadlock kind of a situation here as not a single developed country has indicated that they are willing to move up to 40 per cent. News from the US that the Climate and Energy Bill will not be passed before Copenhagen had its repercussions in Barcelona too. Few negotiators and observers said that this further reduces whatever little chances we had of getting an ambitious and multilateral agreement at Copenhagen. The European Union in its press conference re-confirmed their intention of negotiating for a single and new legal instrument to replace the Kyoto Protocol. They clarified that they still wanted this to be a multi-lateral and legally binding treaty. But they refused to directly answer the question about what they didn’t like about the Kyoto Protocol because of which they want it to be replaced. They added that there were concerns from a few quarters that there may not be enough time left to reach the treaty they want at Copenhagen and if that wasn’t possible then harvest a strong deal at Copenhagen. “We still do not know what is possible to reach in Copenhagen,” Ambassador Metzger from the EU said. He also indicated that, just like Kyoto, we may have to wait for the last night to reach a deal. “We will have the full picture in the last days of Copenhagen, may be even the last night,” he said. So that was the picture here today. Hectic activity, but no real progress. 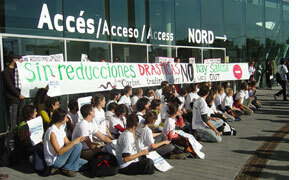 Protesters at Barcelona today took the step of locking climate negotiators inside a room to force them to talk. This morning, just after the start of formal negotiations, a group of about 50 to 60 protesters sealed off the exits of the Barcelona Convention Centre where the climate talks are being held. They taped shut the gates then sat in front, chanting slogans demanding climate justice. The UNFCCC secretariat and security personnel were taken by surprise. As delegates realised they were locked in, there was a mad search for alternative exits. It’s official: The US climate bill won’t clear the US Senate before Copenhagen. Republican senators are refusing to even debate the bill until further studies are completed—five weeks from now. Africa Group negotiators explain why they’ve asked talks to be suspended; G77 negotiators respond. The plenary session AWG-KP just concluded with the Chair passing the proposal that negotiations in the group would resume from tomorrow. But the resumption comes with a rider. 60 per cent of total time of the AWG-KP would be spent in discussing numbers and 40 per cent on other issues. Between Wednesday and Friday a total of 10 sessions of contacts group under the AWG-KP remain. This means that out of these six sessions would be spent discussing Annex I targets. Just after the Chair passed the proposal for resuming talks, the Gambia, on behalf of African group took the floor and warned that unless real and ambitious progress is made they would again call for suspension for all negotiations. The Gambia said that Annex I aggregate targets had to be decided in the April meeting and individual targets should have been decided by June. But neither has been done till date. He said that the current stated level of ambition of Annex I countries is unacceptable and that the total cuts should be at least 40 per cent. They stressed that all Annex I parties must indicate what percentage of their reductions would come from domestic efforts, offsets and by using LULUCF. He warned that failure to reach serious and ambitious conclusion on numbers would lead them to suspend negotiations on other issues. India took the floor and said that unless there is a heightened level of ambition, as science says is required, the prospects of success at Copenhagen remain bleak. China said that just giving more time is not enough but what is required is meaningful negotiations and ambitious targets on the table from the Annex I countries. To break the deadlock the Chair had held meetings with various parties since last night to convince them to go ahead with the negotiations. Today the African group had bilateral talks with the EU and the Umbrella Group and this seemed to have clinched the approval of the African Group. Delegates wondered what transpired between the EU and the African Group which led to the decision. Earlier Anders Turesson, head of the Swedish delegation had refused to comment on what happened in the meeting. He said: “We share there concern very much. We are also eager to raise the joint level of ambition amongst the developed countries. And we must find a way to go forward on this together. We have also explained to them that we need to discuss all things that are relevant in the negotiations and the way that they have been trying to limit and confining the discussion may not be very productive. So we have had that exchange of views. It has been a good discussion and perhaps we may come closer now (to breaking the deadlock). But that’s all for now I am afraid.” On there being a deadlock in negotiations Turesson said: “I won’t call the situation a full deadlock.” On being asked whether KP negotiations will resume he said: “We hope so but I don’t know. To be frank we have a difficult situation that is for sure and as I said we understand the background to this situation but we believe that we should move forward together. When CSE asked him about whether there has been a shift in the stance of African group he says he cannot comment on this. “I don’t what to comment on that I am afraid, I can’t comment on that, on ant details in our discussion because our discussion is still going on. All I can say is that we had a very good discussion.” He added that they are committed to a second commitment period. CSE: The second commitment period you are talking about will it be under Kyoto or under a new treaty? Turesson: We don’t know yet but our preference would be one single legal instrument that would contain the Kyoto system. CSE: Will it be multilateral or domestic action enshrined in a treaty? Turesson: We are very strongly for a multilateral agreement. CSE: Not a pledge and review system… Turesson: Definitely not. The EU would definitely prefer, not only prefer but it’s a pre-condition in fact that we have a truly multilateral solution because climate change is global problem and it can only be addressed through multilateral solutions. The simmering anger of developing countries against developed countries’ inaction finally erupted on the opening of the Barcelona climate change talks. The African group, a block of African nations, said that the only negotiations they are willing to undertake in the Ad-hoc working group on Kyoto protocol were the second phase emissions reduction commitments of the Annex I nations. They reason, this being the basic and most important issue, till the time there was clarity on these numbers it was meaningless to undertake emissions on all other aspects. The move was termed as “shocker” by seasoned negotiators and that it came completely unexpected. The African group has asked the Chair of AWG-KP to hold discussions with all the parties and come to an agreement. Today no negotiations were held under the AWG-KP and the Chair was expected to undertake informal consultations with Parties to decide on future course of action. Till now the informal consultation has not taken place. Significantly just an hour back the G-77 and China group gave its backing to the African move saying that the group supported the statements made by the African group. “We are being taken for ride for several months now,” P Ousman Jarju, negotiator from Gambia and the Chair of African group in the AWG-KP said in a private conversation. “The Annex I nations only want to negotiate on issues which give them a cop out. They are keen to discuss LULUCF and flexible mechanisms but when it some to there targets they won’t budge. We are saying that we refuse to give the Annex I countries a blank cheque by giving them LULUCF and other offset options. We need to know clearly what will be there domestic reduction efforts before we give them these options,” Jarju said. “For the last two years we have been patient. Meetings after meetings they tell us that they will come up with there targets soon but it hasn’t happened till date and we are just days away from Copenhagen,” he added. It’s not that the African statement has come out of the blue. On October 20, African group had endorsed a statement at the thirteenth African Union summit held at Sirte, Libya. Though not saying exactly the same thing the statement made clear that “Africa will not accept any delay by developed countries to deeply cut their greenhouse gas emissions and support Africa to adapt to the negative impacts of climate change”. The group insisted that the fate of negotiations now depended on Annex I parties and what will be there response. Chair’s informal consultations are expected to take place tomorrow to work out a solution to the stalemate. But it will be very difficult because the Annex I countries are refusing to commit to second-phase targets. In fact they are increasingly unwilling to discuss reduction targets within the KP working group and, by the day, the developed nations’ call for a new treaty is getting stronger. The EU is now openly articulating its proposal for a new unified treaty which would include certain aspects of the Kyoto protocol. As climate negotiations resumed in Barcelona on Monday, an unexpected development occurred: African countries demanded that until Annex I countries set firm emissions targets, all other negotiations be suspended. The richest 10 per cent of Indians emit no more greenhouse gases per person than the poorest 10 per cent of Americans, according to new analysis by the Centre for Science and Environment. The CSE study looks at how per capita emissions vary within India and the US, when populations are ranked according to income level: poorest 10 per cent, richest 10 per cent, etc. Significantly, the results refute claims that a burgeoning middle classes in India is hiding a sizeable contribution to global warming behind the extremely low per capita emissions of India's poor. Instead, they underscore the reality of the situation: Industrialised countries are diverting attention from their own burgeoning emissions by falsely pointing fingers. For the first time, we give you an exclusive glimpse into the Down To Earth cover story appearing in the upcoming issue. On Wednesday, the UNFCCC released preliminary emissions data for Annex I countries in 2007. The data show that CO2 emissions from this group (excluding the ex-Soviet bloc) have increased by 16 per cent since 1990. Since the last report in 2006, CO2 emissions increased by 1.1 per cent, which works out to an increase of 128 million tons. This year-over-year increase is equivalent to the total CO2 emissions of more than 100 million people living in India. Environment Minister Jairam Ramesh, in a leaked letter to the Prime Minister, suggested that India should have “no great theological objections” to the “Australian Proposal”. What was he referring to? The Australian Proposal is an idea, first mooted — and still championed — by Australia, to replace the Kyoto Protocol with a series of national “schedules”. A new bill in the US Senate would legislate domestic action on climate change. The so-called Kerry-Boxer bill promises to cut industrial emissions by 20 percent below 2005 levels in 2020, and by 83 per cent in 2050. But if you crunch the numbers, you find it's possible for American industry not take any action in their own operations until well past 2030. How can this be? There are three culprits: weak targets, too many offsets, and generous rules around "banking" offsets to use in future years.